5. Candidates must be Bangladeshi by born. Educational Qualification: SSC pass and 3 years Diploma Course from any Govt. Approved Medical Assistant Training School. Educational Qualification: 3 years Diploma Course with Bangladesh Pharmacy Council Registration. Educational Qualification: Diploma or Certificate in Printing Technology from a recognized Institute with adequate experience in the related filed. Educational Qualification: Graduate Degree with Second Class and Minimum 3 years experience. Educational Qualification: Diploma in Commercial Art from any Reputed Institute. a. Graduate, Preferably Science, Relaxable for departmental Data Entry/Control Operator with at least 2 years. b. Must quality Operator’s aptitude test. Educational Qualification: HSC or Equivalent pass and other requirement see advertisement. Application Fee: BDT. 111.50 (Heavy) and BDT 56.00 (Light). b. Required application form fill up carefully. c. Click next step and see preview your application and check your application carefully. e. Submit the Application Form and Download the applicant copy. f. Print the applicant copy A4 size paper and complete payment in bKash within 72 hours. 3rd Step: bKash Merchant Account: 01795551432. Directorate General of Family Planning authority will be notify by SMS your mobile phone when ready your Admit Card. You can login your User Id and Password and download Admit Card from www.dgfp.gov.bd. Your Admit Card all information are mentioned Examination Date, Time, Venue and Details seat location. 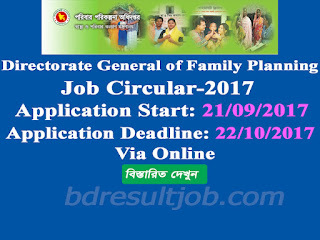 You can visit Directorate General of Family Planning Official website www.dgfp.gov.bd for further information. After examination Directorate General of Family Planning authority will published as soon as possible exam result. 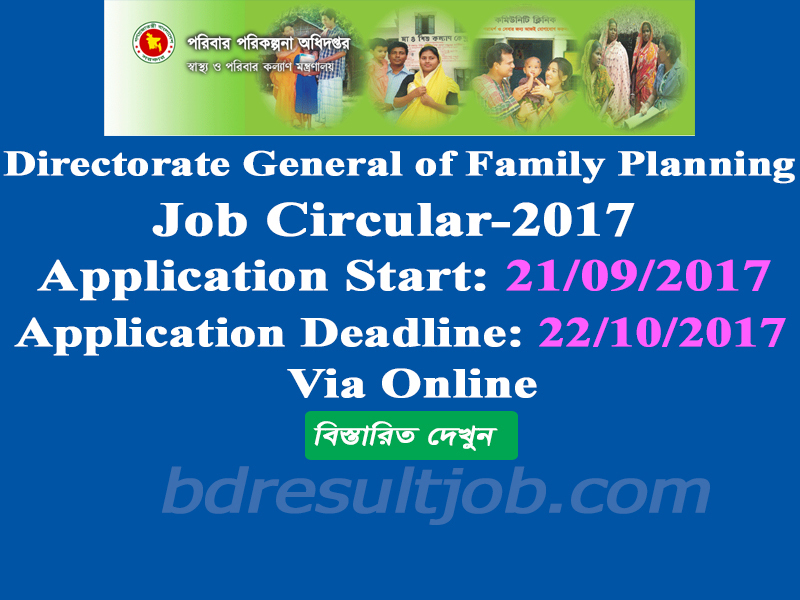 Tags: www dgfp gov bd, Directorate General of Family Planning job Circular 2017, Directorate General of Family Planning Result 2017, Directorate General of Family Planning Admit Download, Directorate General of Family Planning job Circular 2017 Exam Result 2017, Directorate General of Family Planning FWV job Circular 2017,Directorate General of Family Planning FWV Result 2017, Directorate General of Family Planning FWV Admit Download, Directorate General of Family Planning FWV job Circular 2017 Exam Result 2017.